Nine St Patrick’s College Wellington students are currently in Thailand teaching English to Burmese students at the Marist Mission in Ranong. Most of the Burmese students are from the Marist school in Ranong, Southern Thailand, however others from neighbouring learning centers have also joined them for the “English camp”. The mission experience is happening during the St Patrick’s students’ summer holidays. As well as teaching English, the St Patrick’s students are experiencing first hand what so many confront daily; just to survive. The idea to take St Patrick’s College students to Ranong is the brainchild of St Patrick’s teacher, Mr Maurice Atkinson. 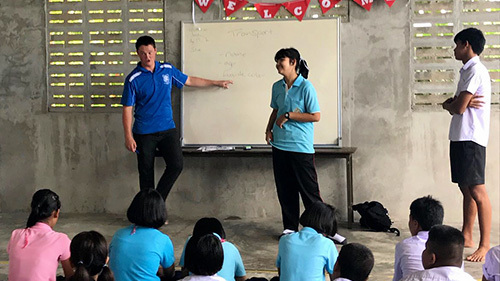 Mr Atkinson and his wife Natalie spent 18 months in Ranong as volunteer teachers, and the experience of helping those in difficult circumstances made a lasting impression on both. Traveling with the group, Fr Matthew Crawford SM says the St Patrick’s students are experiencing entirely different circumstances to their own. “The experience seems invaluable, perhaps even life-changing”, he said. Matthew Crawford says the St Patrick’s students have been struck by the dedication and determination the Burmese teenagers bring to their studies. “Some young people in New Zealand are almost proud of how little work they can do in school, while for these students, few things are taken more seriously”, commented Dominic Bell, a St Patrick’s student. “Receiving an education and in particular knowing English will be very freeing for these Burmese students”, says Hugo Bell. Johnny English adds, “It opens up other work opportunities beyond the local fish and charcoal factories”. Maurice Atkinson describes the trip as providing powerful examples of faith in action for St Patrick’s College students. “The Marist priests, Frs Frank Bird, Keven Medilo and Gil Casio along with two Burmese nuns and volunteers show God’s love through their commitment to those who are vulnerable and who the world sees as unimportant”, he says.